You’ll never forget the excitement that went into buying your first home. You’ll always remember the first time you set eyes on a house, took in its beauty and just knew that that was where you had to start your life. I’ve always been fascinated by architecture; have been drawn to the incredible way in which they tell a story. Today I’m going to talk about one of the most popular housing styles in America- the British Colonial style that found its way into our country in the late 19th century and has never gone out of style. Most British colonial homes are two, sometime three stories high. These homes have steep roofs with front or side-facing gables and narrow eaves. In this picture you see front-facing gables. Although it isn’t uncommon to find both front as well as side-facing gables in most British colonial style homes. 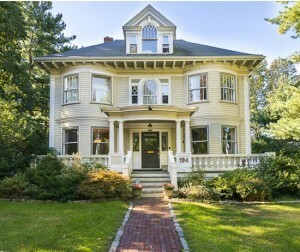 British colonial homes are known for their perfect symmetry. The exteriors of such homes are wood framed with clapboard siding or shingles. With uniform distance between the windows, you’ll find them in pairs or threes on either side of the entrance. The two most windows you see in British colonial architecture are evenly spaced, shuttered double-hung multi-pane windows and small casement windows. The beauty of these windows is that they look good with just any sort of architectural design. Local contractors like Champion Windows can also custom-make windows to best suit the look and feel of your house if you decide to give it a makeover. One of the most fascinating features about British colonial architecture is the presence of one or more dormers. In case anybody was wondering, dormers are windows that project vertically from a sloping roof. Dormers add a touch of grace to British colonial architecture. And it doesn’t just stop there; some of these homes have one (if not more) massive chimney, transporting you to a time long, long ago. In most British colonial homes you’ll find a decorative semi-circular window over the front door. These doors are flanked by glass columns on either side. The front doors themselves aren’t very elaborate; it’s not common to find carved front doors, but they’re usually sleek with wrought-iron lamps on each side. When you say British colonial, my mind immediately jumps to chestnut trunks and deep mahogany furniture, subtle and demure cream linens and sofas, wallpapers printed with safari designs, rattan furniture, and gray or beige sisal rugs. And you can’t help but love the cream and beige of the rugs and curtains in complete contrast with the rich, dark tones of the mahogany furniture. But that’s not where it ends. You can’t have British colonial interiors without the homely comfort of leather-bound books, potted tropical plants, framed sepia photographs and an antique writing desk. It is when all these elements come together that you see your British colonial dream home take shape; a home that is warm, earthy, inviting and absolutely elegant.